New Delhi: BJP MLA Vijender Gupta raised questions over the quality of services at AAP government’s mohalla clinics by alleging that a pregnant woman was tested positive for Thalassemia at one such clinic but the results were later found negative at a private pathology laboratory. “The pregnant woman, Mausam Kumari, visited the mohalla clinic at F Block in Rohini along with her husband Mukesh on April 24, where tests were done. The report revealed that she had Thalassemia,” he claimed. The tests were then done at a private pathology laboratory where it was found that she was not suffering from the disease. The doctor at the laboratory said the mohalla clinic lab report was “incorrect” and “technically wrong”, the Leader of Opposition in the Assembly claimed. 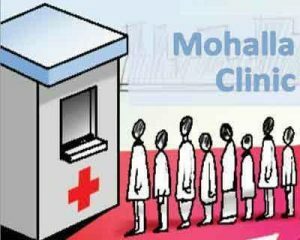 There were also some other cases of “negligence and wrong reports” at mohalla clinics and its laboratories but people are not coming out with their complaints, the BJP leader claimed. Claiming that people are reluctant to report these cases for different reasons, Gupta alleged, “The mohalla clinics and pathological labs are substandard,” and appealed people to reveal cases of wrong treatment and tests to make others aware about it. The government should “stop playing” with the lives of people with “negligent and substandard” health services at these clinics and labs, he said and demanded a probe into the case of Mausam Kumari and other such incidents.